Originally published in 1953, this third edition was first published in 1970. It was one of the early attempts at bringing together theories of personality organisation and finding empirical evidence to test their hypotheses. This third edition includes additional chapters and updated references to current research of the time. It is a particular feature of this book that a large number of figures are reproduced in the text; this is essentially a consequence of the writer’s belief that diagrammatic representations are better suited to the transmitting and remembering of information than are words or numbers. 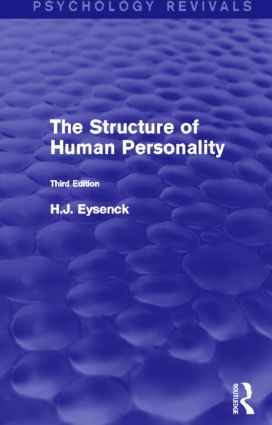 The first chapter outlines the theories and discusses some of their implications, the second and third look at methods of analysis and projective techniques, while the rest of the book is devoted to a critical presentation of the evidence, arranged according to the technique employed – rating, self-rating, objective testing, constitutional assessment, autonomic measurement, and so on. Today it can be read and enjoyed in its historical context.